Is Flaxseed Oil Safe During Pregnancy? Is Flaxseed Oil Safe While Breastfeeding? 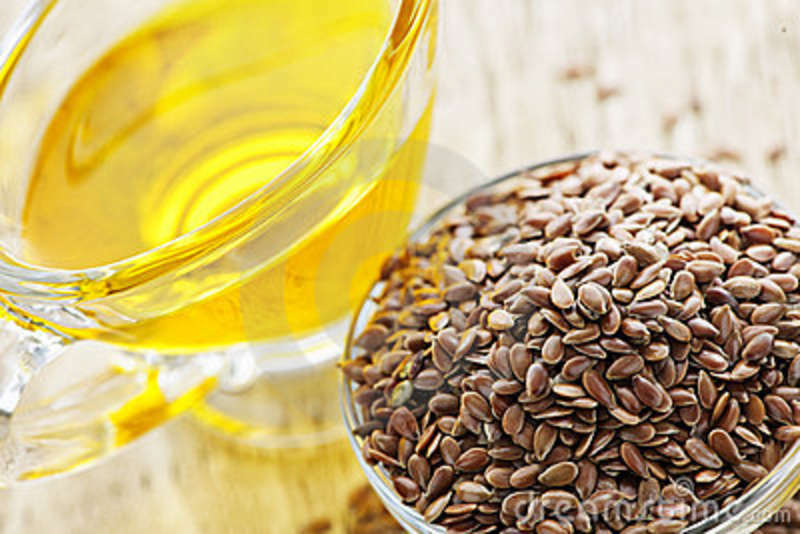 Flaxseed oil, also known as linseed oil, comes from the seeds of the flax plant (Linum usitatissimum, L.). It is a blue flowering plant that is extensively grown on the Western Canadian Prairies for its oil rich seeds. This natural oil is highly recommended for the general well being and whole body nutrition and is considered to be nature's richest source of omega-3 fatty acids that are required for the health of almost all body systems. The oil is a very good way to get your omega 3s, especially if you are allergic to seafood. People use flaxseed oil for many different ailments and can be a great addition to a diet. The oil has a nutty flavor and enhances a salad dressing but you shouldn't use it to cook since the heat changes the healthy fat into toxic fat that causes harm. Instead, most people find that adding the oil to a dish that's already cooked can enhance the flavor and add many beneficial nutrients to the diet. Flaxseed oil contains a number of vitamins such as B1, B2, C, E and carotene, a form of vitamin A. The oil also contains omega-6 and omega-9 essential fatty acids, zinc, iron and trace minerals such as magnesium, phosphorus, potassium and calcium in addition to being a good source of omega-3 fatty acids that promotes heart health. Flaxseed oil provides approximately 50 - 60% omega-3 fatty acids in the form of alpha-linolenic acid (ALA). That is more than is contained in fish oil, but the body is not very efficient at converting ALA into the omega-3 fatty acids found in fish oils. So ALA from flaxseed may not have the same benefit as eicosapentaenoic acid (EPA) and docosahexaenoic acid (DHA) from fish oil. People sometimes assume that flaxseed oil possesses all the same benefits as flaxseed, but this is not the case. Flaxseed oil does not contain all of the active components found in flaxseed -- fiber and phytoestrogens (plant-based estrogen-like compounds). This is why you cannot assume that flaxseed oil has the same effects on the body as flaxseed. Omega-3 fatty acids, usually from fish oil, have been shown to reduce inflammation and help prevent certain chronic diseases, such as heart disease and arthritis. The alpha-linolenic acid and related chemicals in flaxseed oil also decrease inflammation. That is why flaxseed oil is useful for rheumatoid arthritis and other inflammatory (swelling) diseases. Getting a good balance of omega-3 and omega-6 fatty acids in the diet is important. These essential fats are both examples of polyunsaturated fatty acids, or PUFAs. Omega-3 fatty acids help reduce inflammation, while many omega-6 fatty acids tend to contribute to inflammation. A healthy diet should consist of roughly 2 - 4 times fewer omega-6 fatty acids than omega-3 fatty acids. The typical American diet, however, tends to contain 14 - 25 times more omega-6 fatty acids than omega-3 fatty acids. Many researchers believe this is a significant factor in the rising rate of inflammatory disorders in the United States. Flaxseed oil is used for for rheumatoid arthritis or for lowering elevated blood fats such as cholesterol and triglycerides. In addition to treating rheumatoid arthritis and high blood fats, flaxseed oil is used for treating osteoarthritis, anxiety, benign prostatic hyperplasia (BPH), vaginal infections, dry eyes, "hardening of the arteries" (atherosclerosis), high blood pressure, heart disease, diabetes, and attention deficit-hyperactivity disorder (ADHD). In foods, flaxseed oil is used as cooking oil and in margarines. Should you add flax seed oil to your diet? Some nutritionists, researchers, and scientists believe that it could be the most important health-promoting supplement next to a multi-vitamin. Nearly every system in the body can benefit from flax seed oil's natural properties, including the cardiovascular system, immune system, circulatory system, reproductive system, nervous system, as well as joints. Flaxseed -- but not flaxseed oil -- contains a group of chemicals called lignans that may play a role in the prevention of cancer. Research shows low incidence of breast cancer and colon cancer in populations that have high amounts of lignan in their diet. Flax is 100 times richer in lignan than most whole grains. However, in one Canadian Study, researchers discovered that flaxseed oil prevented breast tumor growth, likely through ALA content. Studies show that Omega-3 fatty acids help lower cholesterol and blood triglycerides, and prevent clots in arteries, which may result in strokes, heart attacks and thromboses. Evidence suggests that people who eat an ALA rich diet are less likely to suffer a fatal heart attack. ALA may reduce heart disease risks through a variety of ways, including making platelets less "sticky," reducing inflammation, promoting blood vessel health, and reducing risk of arrhythmia (irregular heart beat). Preliminary evidence that suggests taking 1 - 2 g of flaxseed per day can improve the symptoms of dry eye in people with Sjogren's syndrome. Sjogren's syndrome is an autoimmune condition where the immune system attacks glands in the body that produce moisture, like salivary and tear glands. Flaxseed oil also helps protect the body against high blood pressure, inflammation, water retention, sticky platelets and lowered immune function. It shortens recovery time for fatigued muscles after exertion. It increases the body's production of energy and also increases stamina. It accelerates the healing of sprains and bruises. It eases weight loss in people afflicted with obesity. It stimulates brown fat cells and increases the metabolic rate making it easier to burn off fat. Flax seed oil improves the absorption of Calcium. Flax seed oil strengthens finger and toenails. It can improve eyesight and perception of colors. It can often improve the function of the liver. It can relieve the side effects and stop development of many forms of cancer. It can relieve some cases of Asthma. It is helpful in the treatment of Eczema, Psoriasis, and Dandruff. It can relieve the symptoms of Rheumatoid Arthritis. It can relieve the symptoms of Diabetes Mellitus. It can alleviate some allergies. It helps prevent Atherosclerosis (the accumulation of fatty deposits inside the blood vessels, especially the large and medium-sized arteries, that many people experience during the aging process). Flax seed oil lowers high blood pressure in Hypertension sufferers. Flax seed oil has been scientifically proven to treat some cases of depression. It can improve the mental function of many old age pensioners. It can help in the treatment of Multiple Sclerosis. It has been proven to improve the behavior of Schizophrenics. It can relieve some cases of Premenstrual Syndrome (PMS) in females. ability, water retention, inflammation pain, nerve transmission. Unfortunately, our current diets do not come close to meeting our daily EFA (essential fatty acids) requirements. The richest sources of EFAs such as flax seeds, cold-water fish, and soy and canola oils are rarely found in our regular meals. In addition, more typical foods like red meats and egg yolks can actually encourage the body's production of bad prostaglandins. Flax Seed oil can help restore the body's natural balance of good and bad prostaglandins. Flaxseed oil is available in liquid and softgel capsule forms. Like any oil, flaxseed oil may turn rancid if it is not refrigerated. Flaxseed oil requires special packaging because it is easily destroyed by heat, light, and oxygen. The highest quality flaxseed products are made using fresh pressed seeds, bottled in dark containers, and processed at low temperatures in the absence of light, extreme heat, or oxygen. Be sure to buy flaxseed oil supplements made by reputable companies who certify that their products are free of heavy metals, such as lead and mercury. There's no recommended dose for flaxseed oil. The best dose for you depends on a number of factors and should be determined in consultation with your physician. Flaxseed oil: Take 1 - 2 tablespoonfuls daily, or 1 - 2 capsules daily. Flaxseed oil is often used in a liquid form, which contains approximately 7 grams of ALA per 15 mL (1 tbsp), and contains about 130 calories. It's important to buy high-quality flax seed oil as it is prone to rancidity. Light and oxygen will slowly breakdown the essential fatty acids. Look for flax seed oil capsules (dark coated soft gels) or oil that is bottled in amber-brown bottles, as these are more resistant to the light and oxygen. Make sure you refrigerate your flax seed oil to help extend its shelf life. Flax seed oil takes a bit of time to be absorbed into the body before the full beneficial effects begin, ranging anywhere from a few days to as many as six weeks, depending on your overall well-being. When taken at reasonable doses, flaxseed oil is unlikely to cause side effects. For most people, any side effects that occur are usually just bothersome. However, flaxseed oil can theoretically cause serious side effects as well, especially at high doses. If you take more than 30 grams of flaxseed oil (about two tablespoonfuls a day), you might experience diarrhea or loose stools. Allergic reactions have occurred while taking flaxseed oil. Flaxseed oil is obtained from flaxseed, but does not cause all of the bothersome flaxseed side effects. Flaxseeds (which have a high fiber content) often cause gas and bloating. Flaxseed oil (which does not contain fiber) is not likely to cause such side effects. Theoretically, high doses of flaxseed oil could increase the risk of bleeding. This is especially important for people who are already at risk for bleeding, such as those with a bleeding disorder. There are a few side effects with flaxseed oil that you should report to your healthcare provider and which may indicate that you should stop taking the supplement. Flaxseed oil is probably safe for most pregnant women, especially when consumed in normal dietary amounts. Some claim however that flaxseed oil is unsafe during pregnancy, and that it might affect the fetus or cause premature labor, but others reject this notion. It is always a good idea to clear it with your healthcare provider first before consuming flaxseed oil. Flaxseed oil is not exactly the same as flaxseed, since the oil does not contain all of the active components found in the seeds. The information in this article does not apply to flaxseed. Although flaxseed oil is a good source of some omega-3 fatty acids, it does not contain the type of omega-3 fatty acid most often recommended for pregnant women (docosahexaenoic acid, also known as DHA). Although little research is available concerning the safety of flaxseed oil during pregnancy, normal amounts (such as those found in foods) are probably safe for pregnant women. High doses of flaxseed oil could theoretically increase the risk of bleeding. If you are pregnant, a moderate approach to flaxseed oil is probably best. Occasional use, especially in foods, is probably safe. Medicinal use (at higher doses) may not be safe. To be on the safe side, you should talk with your healthcare provider before using flaxseed oil during pregnancy. Each woman's situation is different, and you and your healthcare provider understand your situation best. After considering what you want and expect, as well as your current health situation, you and your healthcare provider can make a shared decision about flaxseed oil and pregnancy in your particular situation. Flaxseed oil is probably safe for most breastfeeding women, especially when consumed at normal and reasonable amounts. However, some claim problem could occur if breastfeeding women consume flaxseed oil. If you are pregnant or breastfeeding, it is always a good idea to talk to your healthcare provider before taking any herbs or supplements. It is important to understand that flaxseed oil is not exactly the same as flaxseed, since the oil does not contain all of the active components found in the seeds. The information in this article does not apply to flaxseed. Although flaxseed oil is a good source of some omega-3 fatty acids, it does not contain the type of omega-3 fatty acid most often recommended for breastfeeding women (docosahexaenoic acid, also known as DHA). Although little research is available concerning the safety of flaxseed oil during breastfeeding, normal amounts (such as those found in foods) are probably safe for use while breastfeeding. It is not known if higher doses (such as for medicinal purposes) are safe. You should talk with your healthcare provider about flaxseed oil and breastfeeding. Each woman's situation is different, and you and your healthcare provider understand your situation best. After considering what you want and expect, as well as your current health situation, you and your healthcare provider can make a shared decision about flaxseed oil and breastfeeding in your particular situation. If you are being treated with any of the following medications, you should not use flaxseed oil (alpha-linolenic acid or ALA) or other omega-3 fatty acids without first talking to your health care provider. Blood thinning medications (anticoagulants) -- Omega-3 fatty acids may strengthen the effects of blood thinning medications, including aspirin, warfarin (Coumadin), and clopedigrel (Plavix). While the combination of aspirin and omega-3 fatty acids may help treat heart disease, they should not be taken together without the supervision of a health care provider. Cyclosporine -- Taking omega-3 fatty acids during cyclosporine (Sandimmune) therapy may reduce toxic side effects, such as high blood pressure and kidney damage, associated with this medication in transplant patients. Etretinate and topical steroids -- Adding omega-3 fatty acids (specifically EPA) to the drug therapy etretinate (Tegison) and topical corticosteroids may improve symptoms of psoriasis. Nonsteroidal anti-inflammatory drugs (NSAIDs) -- In an animal study, treatment with omega-3 fatty acids reduced the risk of ulcers from nonsteroidal anti-inflammatory drugs (NSAIDs), including ibuprofen (Motrin or Advil) and naproxen (Alleve or Naprosyn). More research is needed to see whether omega-3 fatty acids would have the same effects in people.